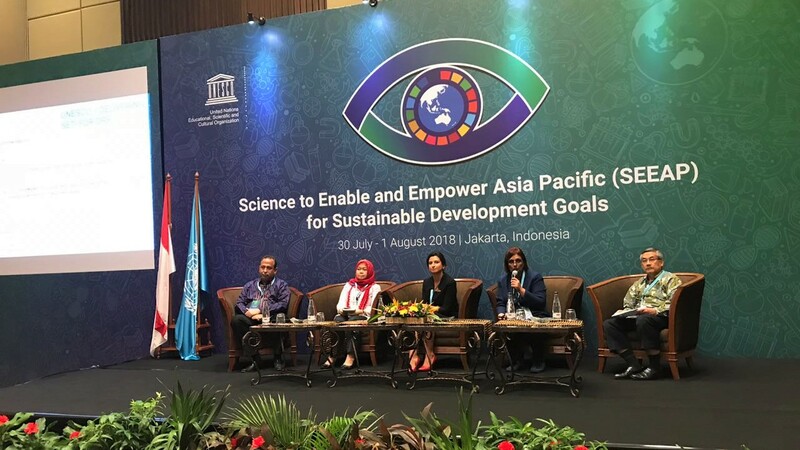 On 29 July – 1 August 2018, a regional strategic coordination meeting “Science to Enable and Empower Asia Pacific for Sustainable Development Goals (SDGs)” took place in Jakarta, Indonesia. The meeting was organized by UNESCO Regional Science Bureau for Asia and the Pacific in Jakarta. It brought together representatives of the UNESCO Natural Sciences family from across Asia and the Pacific region, government representatives and key stakeholders from UNESCO’s scientific networks, including the International Hydrological Programme (IHP), the Man and the Biosphere Programme (MAB), the UNESCO Intrenational Geoscience and Geoparks Programme (IGGP), UNESCO Chairs and Category 2 Centres, as well as other science partners in the region. The event was organized to devise strategies and modalities for UNESCO’s science programmes in Asia and the Pacific and to serve as an efficient delivery platform for the implementation of the 2030 Agenda and the SDGs. The meeting enhanced further dialogue, cooperation, networking and sharing of knowledge and resources among the UNESCO field offices and networks, which is essential to make an effective global contribution. It discussed possible joint project proposals on various UNESCO programmes and themes, such as water management, disaster risk reduction (DRR), biosphere reserves, geoparks and others. UNESCO Almaty office, present by its Natural Sciences programme specialist, shared experiences from Central Asia, notably on DRR activities and was involved in co-moderating discussions in workshop groups on DRR as well as IGGP programme.